Senior professors at Boston University use piece in influential journal to label prison camp ‘a medical ethics free zone’. A group of senior American doctors has called on military physicians at Guantánamo Bay to refuse to work in a mass force-feeding programme that is being used to keep hunger-striking detainees alive. Writing in the prestigious and influential New England Journal of Medicine, the three doctors called Guantánamo “a medical ethics free zone” and said that medical staff had a moral duty to allow the prisoners to go on hunger strike without coercing them into treatment. They also called on doctors to refuse to take part in force-feeding. “Military physicians should refuse to participate in any act that unambiguously violates medical ethics,” wrote Dr George Annas, Dr Sondra Crosby and Dr Leonard Glantz, in a three-page article outlining an ethical case against force-feeding of the detainees. All three are senior medical professors at Boston University. 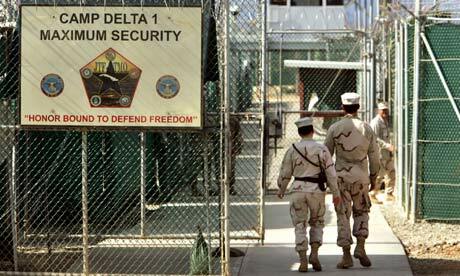 Military physicians who refuse to follow orders that violate medical ethics should be actively and strongly supported … Guantánamo has been described as a ‘legal black hole’. As it increasingly also becomes a medical ethics free zone, we believe it’s time for the medical profession to take constructive political action. The hunger strike among the 166 detainees at Guantánamo Bay – the vast majority of whom have been held without charge for more than a decade – began in February, over allegations that guards had behaved roughly and mishandled Qu’rans when they discovered contraband in prisoners’ cells. The allegations have been strongly denied by military authorities but the strike has now morphed into a broader protest about conditions at the base and the fate of those held there. Despite the fact that 86 of those held have been cleared for release, there is little concrete sign that they will be transferred any time soon. The hunger strike has caused headlines around the world and highlighted the failure of President Barack Obama to fulfill a 2008 campaign promise to close the base. It has, however, prompted Obama to address the issue. In a high-profile speech in May the president renewed his vow to shut the base down and said he would transfer cleared prisoners to their home countries and appoint a top official to oversee that process. Since then, no appointee has been named and no prisoners have been released. Instead the hunger strike has continued to grow amid reports of a tough internal crackdown on protesters that has seen them subjected to body searches and often put in isolation cells. On Wednesday there were 104 detainees on hunger strike, 43 of them being force-fed by medical staff including a team of more than 40 experts specially flown out to the base. In an interview, Dr Annas said the force-feeding went against international standards of medical ethics. He said that a hunger strike was a legitimate form of protest – not an attempt to commit suicide – and that the portrayal of doctors at Guantánamo as ethically intervening to preserve life was wrong. “That is at the core of this. These people are not trying to commit suicide. They are risking death to make a political point,” he said. Even if intended to benefit, feeding accompanied by threats, coercion, force or use of physical restraints is a form of inhuman and degrading statement. In their letter, Dr Annas and his colleagues backed that sentiment. “Their goal is not to die but to have perceived injustices addressed,” they wrote of the hunger-striking prisoners. A military spokesman for Guantánamo said doctors and other medical staff at the base were treating the detainees ethically and with great care. “The health and well-being of detainees is their primary mission, and they take this duty as seriously as they take their duty to provide medical treatment to US service members or any other patient in their care,” said Colonel Samuel House.